My grandfather on my mother's side served in the Navy in WWII. He and his shipmates were stationed in Hawaii just outside of Pearl Harbor. Their job was to search for and remove mines from the water. Being the 40s, there wasn't much skin care education at the time. 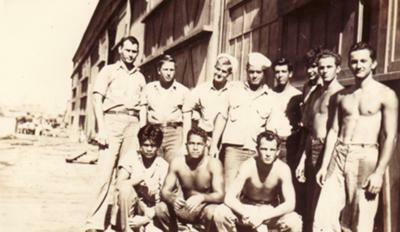 The sailors went without shirts all day out on the boats, skimming the water for mines. 50 years later my grandfather developed Melanoma Skin Cancer on his back. It progressed very quickly and it was determined that treatment outside of comfort care would not be effective in improving his quality of life. They set up hospice care for him and sent him home to be with his wife and family. My mother is one of eight children that my grandfather and grandmother raised in a small house in Oregon. My mother was the only child to leave the West Coast when she moved to Virginia at the age of 18. When my mother found out about her father's cancer she did everything she could to visit him as soon as possible. By the time she was finally able to fly across country, her father had already deteriorated greatly. When she entered her father's bedroom he looked up, began to cry, and said, "I never thought I'd see you again". One week after she returned to Virginia, her father passed.